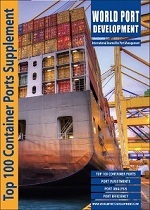 Our 'Market Intelligence' feature in World Port Development is a hit every month with our readers. That feeling of embarrassment when colleagues are talking about a new project or expansion plans and you haven’t got a clue what they are talking about struck a chord with some of our readers! Now by signing up to our free newsletter you can get this information even faster - giving you an edge on your competitors or colleagues. If you would like to receive our regular newsletters you need to create an account. You must be logged in to subscribe to our newsletter.